It's a real shame that it often takes me saying "hey, I can do something else in New York while I'm there!" to get me to the New York Asian Film Festival, but it does. It runs right into Fantasia - my favorite film festival - on the schedule, as well as Boston's great Fourth of July festivities, and with my nieces' birthday party generally the week before, I will often find myself saying, sorry, but I want a weekend where I don't spend a lot of time on a bus and do sleep in my own bed this summer. It's actually been a few years since I last visited, but when I saw that Bong Joon-ho's new film Okja would not only be playing New York, but would be playing right across the street from the theater where NYAFF was going on (all part of The Film Society at Lincoln Center)... well, fine, twist my arm. So I book a bunch of stuff online, get up at 5am so that I can get to South Station for a 7am bus, arrive at the bus stop around 11:30 (early! ), get on the subway so that I can drop my bag off at the AirBNB and get keys for later, and then walk up to 65th street so I can have 9 movie tickets printed out with plenty of time to get an ice cream sandwich at the concession stand before the first show of the day. It was surprisingly smooth! Oh, by the way, for all that I thought Boston was provincial, the twenty-something renting me his couch was surprised that I was able to navigate the subway and get there without any problem. Yeah, the NYC subway is a bit more complicated than the T, but this is not that difficult. So, I got to the theater and settled in for the day, with guests for the late-afternoon and evening shows, although the lighting in the Walter Reade Theater is weird or something; I felt like it made everybody super-pasty previewing the images on my phone. 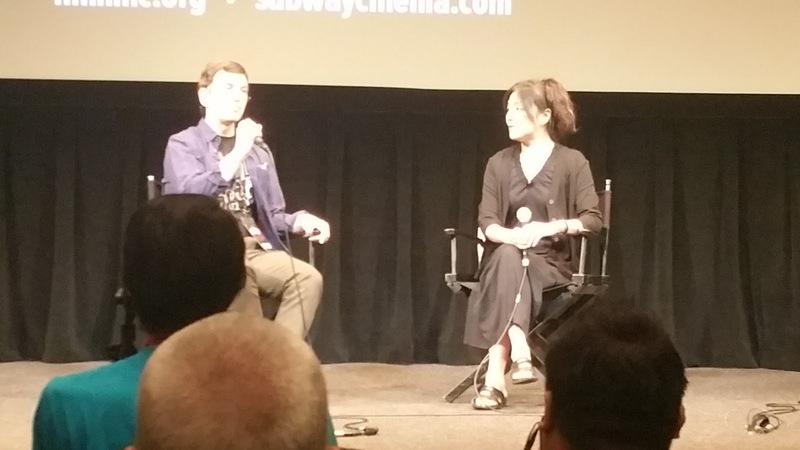 First up was director Chen Mei-jun, who has made documentaries in California for a number of years but returned home to Taiwan to make The Gangster's Daughter, her first fictional feature. The main subject was the setting of much of the film, Kinmen Island. Though we tend to think of Taiwan as a single island, it actually consists of several, but Kinmen is unusual for being 100 miles from Taiwan proper and only 10 from the Mainland, which as you might expect made it fairly hotly contested at points. Ms. Chun was fairly straightforward about why they wound up shooting there - this was always going to be an "island girl" story and this one gave them the best deal, in part because they're working on rebranding. It turns out that they would rather be known for beautiful beaches and quality wineries than being within artillery range of the People's Republic. 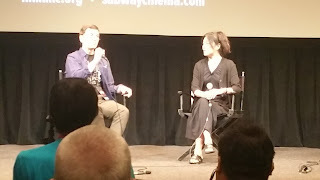 She also mentioned that Ally Chiu did a good enough Kinmen accent that a lot of folks asked where she was from, which is something I admit that I couldn't notice. I don't really have the ear to identify Mandarin immediately, let alone pick up regional accents. We didn't get a chance to talk much about the film specifically, because at least this weekend, NYAFF would bring their guests out before the film and have a little conversation rather than let them do a brief introduction and a more in-depth Q&A afterward, which is a bit different than usual for me, but has its plus-side; it gives the festival a little more certainty in scheduling, and let's be honest - a lot of the good stuff in those Q&As really comes from the questions the hosts ask and which, often being non-spoiler material, can go up front. Plus it doesn't hurt at all to let the audience turn the movie over a bit on their own rather than get someone else's interpretation. 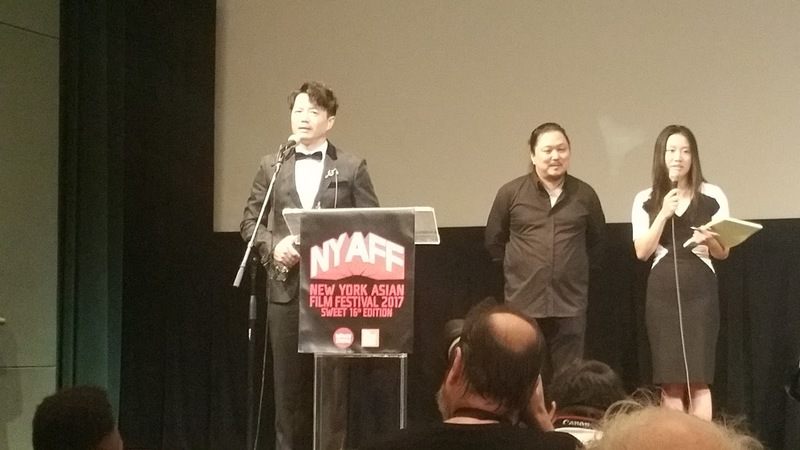 That's Duan Yihong, villain in Extraordinary Mission and the first Mainland-Chinese recipient of NYAFF's Star Asia Award. Not a whole lot to say about him; he got hit with the "do you like playing the hero or the villain" better thing, and the translator relayed the standard "well, it's mostly about playing interesting characters" response. His acceptance speech was kind of jokey, talking about how just as you have to vet the parts you take, you have to vet the festivals you visit, and he was kind of going back and forth on this one (as an aside, I wonder how this is actually viewed from Asia; it's mostly a genre festival that has a name that doesn't signal genre but also plays some more highbrow material). And then they went and had him fly here on United, after all the bad reputation they'd been getting. Not really the super-I'm-very-honored speech you usually get, but that kind of works for this sort of irreverent festival. He seemed a bit amused by the photo-taking as well, like he knew it was kind of silly but you might as well let the paying audience have their fun. Maybe it was different at the 10pm screening of Battle of Memories where he also appeared, but I saw that during its run in Boston, and, remember, up at 5am. So it was back to the apartment to start writing up what I'd seen that day and catch up on my sleep. If the filmmakers were anything close to the age of the cast when they started making Saving Sally, then this thing is even more of an accomplishment than it appears to be; the actors playing Marty and Sally are close enough to actual teenagers that it's noticeable when they came back for reshoots later on in a 10-year filmmaking process. It's astonishingly ambitious for some young Filipino filmmakers, impressive in its accomplishment even if its makers sometimes tip their hats as to how raw they were when they started. Why did it take so long to make? Because there's a ton of very impressive animation in it. Marty and Sally live in a whimsical city filled with monsters, and sometimes things will go fully animated with what is often a simpler, more friendly cartooning style for their flights of fantasy. It's great-looking, though, and often cleverly implemented - the buildings in the bulk of the city are simple enough, with colors just bright and solid enough to be a bit heightened without feeling unreal, that it feels like a place actual people live until something specific can really pop while still fitting in. There's a ton of creative creature design, and the 2D look that never clashes with the live-action people around it, and the cartoon extensions of the practical inventions the title character builds match, even when she's wearing them. It's as smooth and creative an effort to blend animation and live-action as I can remember since Roger Rabbit. Is it occasionally a bit clunky in other areas? Yeah. The story, in particular, is pretty basic: Marty (Enzo Marcos) is a comic-art-loving nerd who is regularly picked on until Sally (Rhian Ramos) intervenes one day and the two become fast friends, with Marty falling for her pretty hard. Sally's foster parents have a lot of rules, though - she has to build a walkie-talkie to communicate with Marty because they won't let her have a phone, and most of the time lets him know she's able to leave the house by hanging specific socks on the clothesline that he can see with his telescope. And then there are the bruises. Plus, while he's still trying to figure out how to deal with all that, she finds an older boyfriend (TJ Trinidad) and uses Marty as their go-between when she's grounded. It's been interesting to see Lee Byung-hun stretch a bit in his Korean roles in the past year, playing a decidedly non-dashing villain in Master and here playing a broken man who is more defined by his passive responses to failure than his usual man-of-action roles. It's the obvious draw for a movie that, while it uses a few familiar tricks, uses them to tell a understanding story of shame and regret. Lee plays broker Kang Jae-hoon, a managing broker at Router Securities Corporation who finds himself left stunned when the company implodes, although as a member of upper management tells him, he's too smart not to have some idea things weren't on the up-and-up. That gnawing in the back of his mind is perhaps why he set his wife Lee Soo-jin (Kong Hyo-jin) and son Jin-woo (Eugene Young) up with a place in Australia for the past two years. Unable to face anybody in Seoul, he heads to Sydney with only the clothes on his back, not even bringing his phone, only to find them thriving a bit better than expected: "Sue" is more relaxed than she has been in years and has taken up the violin again, and the pair seem quite close to neighbor Kris (Jack Campbell) and his daughter Lucy (Annika Whiteley). Unable to bring himself to knock on the front door, Jae-hoon instead finds himself drawn to help "Gina" Yoo Ji-na (Ahn Sohee), who has been working off the books for two years on a tourist visa and has been robbed by the people who offered her a better exchange rate than a bank would on the money she has saved. Park gives an impressively tragic performance, filled with regret and shame, and a palpable sense of his isolation in this foreign land as he can't bring himself to face his family. That isolation becomes especially important later on, and it initially evolves from a man realizing that he may have sold his soul, humbled and saddened by the idea that both the price and return were lower than expected. Lee spends the movie seeming hunched over, as if he was never quite able to fully straighten himself up from abasing himself before the customers he cheated, with the character's imperfect English a way to further focus his performance - he can't be arrogant in that language the way he can in flashbacks to the days before Soo-jin left Seoul. It's a fascinating and damning counterpart to how Kong Hyo-jin plays Soo-jin in those scenes compared to the rest of the movie - the audience sees the relaxed, revitalized Soo-jin first, and it makes the uptight character in the flashbacks hard to connect. It's telling that the mention of Jae-hoon is the only thing that makes her tense up in the present, but Kong never portrays that as bitterness, like Jae-hoon is what's keeping her from being happy with Kris or that trying to check in on him in Korea is a nuiscance. Jae-hoon has caused her pain, but she still cares, even though Lee can't show Jae-hoon taking much comfort from that. It's kind of delightful how relatively non-melodramatic The Gangster's Daughter is, and how its comedy isn't broad slapstick and goofs on Tong tropes. Instead, it plays off how much the father and daughter instantly connect and find they have a lot in common, making for a warm movie that still has room for a lot of laughs and a naturally evolving look at how father Keigo's life is not a perfect fit for daughter Shaowu. 14-year-old Shaowu (a nickname for Shinwu) has been living on Kinmen Island for about ten years, ever since her mother moved them there to get them away from Taipei, where father Keigo (Jack Kao Kuo-hsin) had been rising in the organization of Boss TIgu (Ma Yue-fung). They are reunited briefly at the funeral of Shaowu's mother, but Shaowu (Ally Chiu Si-chin) continues to live with her grandmother (Wu Min) until an incident at school has them strongly suggesting she transfer to Taipei. So she does, meeting Keigo's men Dreamer (Lawrence Ko Yu-luen) and Goldie (Kao Meng-chieh) and his girlfriend MIss Coco (Stephenie Lim Mei-ching). And while they get along fairly well, Keigo finds that his desire to provide a safe environment for Shaowu is increasingly at odds with Tigu's decision to move into hard drugs. There are lots of things to like here, but the bedrock of the film is the lead pair's note-perfect performances. Jack Kao's Keigo has the look of a Takeshi Kitano gangster, but reveals a very likable dad when the dark glasses come off, with a sense that he really doesn't like intimidation, but is instead oddly sensible. Kao is good at being tripped up by unfamiliar situations without looking foolish, and he manages to be quite funny when frustrated by the two well-meaning but not nearly so capable people below him. Whether or not you feel that Extraordinary Mission lives up to its title likely depends on just how you define "extraordinary". 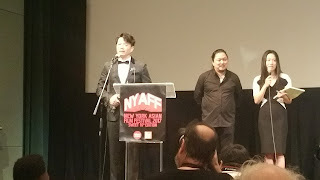 It's not unusual in story - this sort of tale of long-term undercover operations and spectacular drug busts has been done before, and doesn't have the particularly clever twists that director Alan Mak Siu-fai and writer Felix Chong Man-keung pulled off as part of the teams making the Infernal Affairs and Overheard series. When it comes to flat-out action, on the other hand, it eventually earns comparison to Operation Mekong, another recent movie with similar themes, in terms of just how much damage it can dish out before finally winding down. It opens with Lin Kai (Huang Xuan) telling the audience he is a drug trafficker and must never forget that, helping kingpin Cheng Yi (David Wang Yao-qing) distribute his product around the city of Yunlai. This particular night, he is stopped on a bridge in a suspiciously well-timed bust, which is how he learns that Yi will occasionally give up someone minor so that Wang Bo (Zhao Bingrui), a corrupt local narcotics cop, can keep his arrest numbers up. When Lin Kai escapes, Yi protests that this was an accident - someone less valuable was meant to go - and it's good in a number of ways, because Lin Kai has been undercover for three years, working for Captain Li Jianguo (Xing Jiadong) to find Yi's supplier "Eagle" (Duan Yihong), somewhere in the Golden Triangle. To the filmmakers' credit, there's a pretty good rhythm at both ends of the film as the messy failed bust at the start leads to Yi trying to serve up one of Eagle's lieutenants to Wang as compensation, and then at the end when things suddenly become an intensely personal rescue mission practically out of nowhere. It's not just that the action is good - and, boy, it is - but that there's a loose, improvisational feel to what everyone's doing, and the heightened craziness is less foreordained than crazy things happening in extreme circumstances. It's in the middle that things start to flag badly, as everybody gets a backstory and a bunch of flashbacks explaining their motivation, as well as another subplot that fills a little time and moves a couple of pieces around in a way that will be completely forgotten whenever anyone relates the good parts to a friend later. It's even more pointless when you consider that all that attempt at characterization isn't really going to amount to much; the good cops are too pure to ever doubt, the drug kingpins are too cruel to be redeemed, and even if the folks in the middle weren't up against the fairly strict rules for what happens in a Mainland Chinese crime movie, they aren't going to be allowed to outshine the stars. So, for the most part, there's a bunch of bland performances up on screen, with Huang Xuan really only coming alive during the action and not having the sort of chemistry with Lang Yueting (as one of Eagle's lieutenants) that could fuel a good redemption arc. Duan Yihong and David Wang do okay when tossed occasional bits of scenery to chew, but after that, it's a bunch of unmemorable, but not embarrassing, work from the actors.